The Perth Convention Bureau’s (PCB) 2019 Aspire Program is now open to academics at four Western Australian universities, along with individuals involved with not-for-profit associations who are eligible to apply for the City of Perth Convention Scholarship, the Giving West Conference Scholarship and the City of Mandurah Convention Scholarship. In addition, the Telethon Kids Institute Aspire Conference Award is open to staff at the Telethon Kids Institute and the Australian Institute of Management WA (AIM WA) Aspire Conference Scholarship which is open to Professional Members of AIM WA. The 2019 Aspire Program includes two new awards – The Defence West Aspire Conference Scholarship which is open to individuals from WA-based defence industry companies/organisations and the City of Fremantle Aspire Convention Scholarship which is open to individuals involved with not-for-profit associations in the City of Fremantle. To assist potential applicants with the Aspire process the Perth Convention Bureau hosts an annual complimentary information lunch. The lunch aims to help potential applicants understand the Aspire Program, the application process and provides guests the opportunity to hear from a previous successful Aspire applicant. 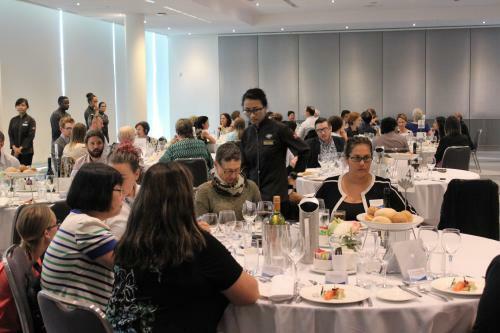 The 2019 lunch will take place on Wednesday 6th February 2019, 12:00pm-2:30pm, supported by venue sponsor the Perth Convention and Exhibition Centre. Registrations are open to all individuals interested in learning more about the Aspire Program. The Aspire Program is a highly successful initiative of the Perth Convention Bureau which supports the aims of Western Australian academics, researchers and professionals, not-for-profit and research communities. The aim of the Aspire Program is to assist the individual’s personal and professional development through attendance at a relevant international conference. The funding covers travel, accommodation and registration expenses to the maximum value of the award. Individual scholarship and award application guidelines are available at www.pcb.com.au/aspire. A wide range of information and support is available to help applicants, for assistance please email aspire@pcb.com.au. The complimentary information lunch will be hosted on Wednesday 6th February 2019 – 12:00pm-2:30pm at the Perth Convention and Exhibition Centre, River View Room 5. All interested parties are welcome to attend, for more information visit www.pcb.com.au/aspire/aspire-events/. RSVP directly to Sophia Okeby, Communications Manager, sokeby@pcb.com.au by Friday 25th January 2019.